Collection of 30 songs by UU composers features wide range from chants and unison songs to 2- and 3-part choral anthems. 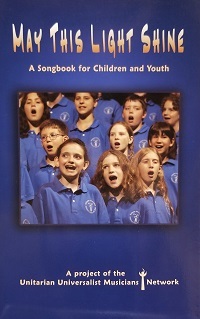 In August of 2003, the Unitarian Universalist Musicians Network (UUMN) Board of Directors charged Wendy Bartel (UUMN Board Member and Director of the Children's Choir and Youth Choir in San Diego) with the creation of a songbook suitable for use with Unitarian Universalist children and youth. Over 90 submissions were received from composers all over the continent. Sixty of those pieces were selected for testing with children and youth in UU congregations. The testers rated the compositions on a variety of criteria such as range, theme of text, rhythm, and group reaction. Thirty songs were eventually chosen for inclusion in this publication. The pieces in are ordered alphabetically and have corresponding numbers. There are chants, songs, and full choir anthems, in addition to children's artwork. Each book is spiral bound so that it can lay flat. The singer's book has vocal lines for those who read music, guitar chords for most of the pieces, and lyric-only sheets for those who can read (or are learning to read) written language. The singer's book is a smaller size to accommodate children's hands. May This Light Shine is dedicated to Rev. Christopher Moore. A staunch supporter of the Unitarian Universalist Musicians Network (UUMN) from its beginnings, Chris inspired and affirmed many of the members in the network. Chris was an ordained minister and attended the very first UUMN conference in 1983. He strongly believed that music of all kinds belonged in the sanctuary. He was a member of the Hymnal Committee, which oversaw the compilation of Songs for the Celebration of Life, now often referred to as the Blue Hymnal. We hope you'll use these songs in your religious education classes, special intergenerational services, children's choir, youth choir, intergenerational choir, or some other creative endeavor you design. Most of all we hope you enjoy this musical adventure in your Unitarian Universalist communities of worship!